New York Colour have generated a lot of beauty buzz since they burst onto the Irish market with a riotous, colourful bang. Available from chemists nationwide, this trend-led brand promises 'big city looks at small prices', with no product in the range costing more than €3.99. I brought their Liquid Lipshine in Fashion Avenue Fuchsia with me on holiday this year and it didn't disappoint, delivering high shine and glossy colour to beat the band. Now you can find out what the fuss is about by winning one of FIVE sets of two NYC nail colours, in Starry Silver Glitter and Pier 17. Starry Silver Glitter is a clear polish with fine silver glitter and larger, hexagonal chunks of purple, blue and turquoise. It's part of NYC's Long Wearing Nail Enamel range. 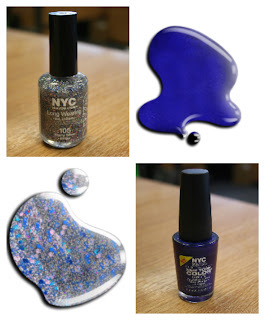 Pier 17 is a Quick Dry Nail Polish and a vibrant, electric blue shimmer. Wear both alone, layer Starry Silver Glitter over Pier 17 or try out an 'insider's tip' from the NYC website and opt for a french manicure with a twist: an electric blue base with a sparkly tip. To enter, just leave a comment below to let me know your current favourite polish, and why. The five winners will be selected with random.org in a week's time. Good luck, and thanks for reading! I love China Glaze shower together. It's my favourite. Would love to try these colours. I got a 'miss sporty lasting colour' there isn't a colour name but the number 450 - its a dark purple recently for my toes - and its the first time an extreme colour is the same as it appears in the bottle, without needed to do 18 coats! Rimmel 'Celebrity Bash' - I love the colour, it's affordable, it's goes on so easy and it lasts for aggggeees! I like Essie nail polish. It's a really great brand and won't chip easily. My favourite Essie polish is 'Turquoise & Caicos' it's a gorgeous Tiffany blue colour. My current fave is a gorgeous minty green from GOSH its so summery and it last ages! I love revlon MIDNIGHT AFFAIR! its fab navy blue colour seems to go with everything i own!! I got a fab purple polish from Penneys - reduced to 50c! I find it hard to find a polish that lasts on my nails, as I'm pretty hard-wearing on them, but this one is really good. It's part of their UV range but looks great otherwise. Current Fave is Barry M Crackle Effect in Black.. Love it over metallic polishes for a funky effect! I love NEW YORK Colours in a New York Minute in East Village. So quick drying I can paint and go! I still love the Chanel 'Ballerina' pink that I got for my wedding three years ago ... it's a bit gloopy now (the nail polish, not the marriage)! I haven't had much opportunity to wear nail polish lately, with a new baby, but would love to update my look with these funky NYC polishes! Rimmel Pro in Peppermint! Long-lasting, summery and easy to match! Orly in Dazzle. It's a gorgeous silver metallic polish. Ciate paint pot in dangerous affair. LURVE! sally hansen complete salon manicure yellow kitty, its awesome! I'm not terribly up to date with make-up - one of the reasons I read your blog. I'm still in love with a dark navy blue polish from Lancome that I bought in April 2010! I love my china glaze for audrey its a fab turquoise colour which is a great summery alternative to coral!